I am going to outline eight extreme training techniques that can be used to shock muscle groups. Learn how these can improve lagging body parts. In order to excel in bodybuilding, you must take your body to higher limits. This could be in the form of diet, training, cardio, or drugs. However, in order to continue to make progress, a bodybuilder must continually push him/herself further and further in all four areas in order to reach their genetic potential. In this article, I am going to outline 8 extreme training techniques that can be used to shock muscle groups into further growth. These techniques can be used during periods of prioritization for specific lagging body parts that wish to be improved upon. Many people have heard about this technique, tried it, found it too mentally taxing to do on a continual basis, and dismissed it as bad news. Any kind of drop-set performed with maximum intensity can produce amazing results to a bodybuilder who is looking to improve a desired area of his or her physique. However, drop-sets, although effective, can lead a bodybuilder into a state of overtraining if they are used in a high volume training routine, and performed on more than one workout through out the week. This means that drop-sets should only be used when trying to prioritize one muscle group at a time; they should not be used on more than one body part in your workout week. Single drop-sets (when you go from one weight to failure and reduce the weight immediately after for another set to failure) are productive if you have already performed a triple drop-set in your workout and you just want to get an extra burn before calling it a day. This can be used effectively on pretty much any exercise. I feel that single drop-sets are a highly effective training technique to bring up a lagging area. Triple drop-sets (when you perform three drop-sets reducing the weight and going to failure on all three sets) are a very productive way to take a normal exercise and make it very torturous. A triple drop-set taken beyond failure is one of the most torturous techniques to shock a muscle into a new growth stage. Triple drop-sets should be used on compound exercises and most isolation exercises. However, I don't feel that it is a good technique for single-arm movements. This is another highly effective training technique to shock your body into new growth. Last but not least, a quadruple drop-set is basically taking a triple drop-set one step further and continuing onto a fourth drop-set to failure. With a quadruple drop-set you are doing a four set drop-set, while taking each set to failure. These are effective to perform on maximum intensity sets for lagging body parts. For instance, this training technique can be used very effectively on an exercise such as the pec-deck fly machine for chest, where you can really isolate the chest. Using this technique on the last set of your isolation exercises can really up the ante of your workout intensity. Almost every bodybuilder or weight training enthusiast should be very familiar with supersets as an extreme training technique. This technique has been around forever, and is a very good way to up the intensity of a workout where you are working opposing muscle groups (biceps/triceps, back/chest) or if you want to burn out a lagging area by supersetting an isolation exercise with a compound exercise. I feel that these are the two most effective ways to incorporate supersets into an advanced high-intensity training program. However, like any extreme training technique the ability to burn your body into a state of overtraining is greater the more you incorporate these types of techniques into your daily workout routines. One of my favorite ways to use this technique is to superset my whole arm workout between biceps and triceps. My normal superset workout looks something like this. The rest pause training technique is probably the least popular out of all of the extreme training techniques that I am going to list, mainly due to the fact that it is one of the hardest training techniques out there. With this technique you pick a general weight that you can complete 8-12 repetitions with by yourself, rack the weight, take 15 deep breaths, and go at the weight again. You are still using the same weight on the second mini-set, but now you are trying to get another 3-5 reps with some assistance, after you complete as many reps as you can to failure you will then rack the weight again, take 15 deep breaths, and try to complete one more set going for another 2-4 reps.
After you struggle to complete your third mini-set, you will first be shocked by how heavy that same weight will feel on the third mini-set, and after you will be pleasantly surprised at how you took a weight you can usually get for 10 and got 18 reps with it as part as a rest pause set. This technique can be used on basically any exercise as a way to increase the intensity of the exercise. However, I feel that this technique is best used on compound exercises and most hammer strength plate-loaded machines. In these situations it is easier to rack the weight, rest, and keep going on your set. If you are using an exercise that involves dumbbells this means putting them down, resting, then getting them back into position. This is unnecessary on a rest pause set, and will drain you of your energy, which is why I think they are best used with barbells, hammer strength, and some cable machines. Negatives are an excellent technique that has also been around for a long time now. This technique basically enables you to push a muscle past the brink of failure by incorporating reduced speed negatives, and partner-assisted positives. This allows you to tear apart the muscle group by slowing down the speed of the repetition after you have taken the set to failure. However, you will need a training partner if you wish to incorporate this technique since it will be implemented when you have already taken your body to positive failure on the set. I personally recommend that you only perform 2-4 negative style partner-assisted reps on a set that is taken to failure. Anything further and you will be risking injury and overtraining. A partner-assisted stress rep is basically when you have taken a set to positive failure and you want to get a few extra reps and push the set a little further. Unlike the negative, you do not slow down your rep speed during the set that stays constant. Your partner will put a minimal amount of pressure under the bar to enable you to still complete 2-4 extra repetitions while causing your muscles to scream in pain due to the increased time under tension. This extreme training technique can be used on practically any exercise in the books. If you train with a partner on a consistent basis these will be very effective in your training regimen, however like a double edge sword be careful not to overuse this technique. The final training technique is partial repetitions, which are basically a way to add a little more stress on the muscle group before racking the weight and ending your set. These are a great technique to use on any hammer strength press machine, since it enables you to start from the bottom position and push off. 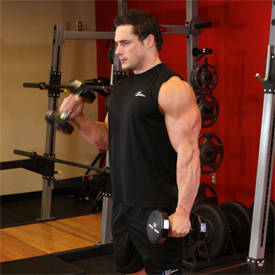 Whereas, it would be harder if you were using a bench press or dumbbells while trying to do a set with partial reps. I also feel that partial reps are better from the bottom position to half way up, rather than half way up to the top position. I feel that they can target the muscle better when you start a partial rep from the stretched position. Each one of these techniques have been proven to be effective at stimulating your muscle groups into new growth, however the one problem that may arise is getting carried away with the various shocking techniques and lead your body into a state of overtraining. This is very easy to do if a bodybuilder is natural and has never incorporated any extreme training techniques into their program before. However, for the enhanced bodybuilder, or even the advanced natural trainer, they might be able to combine a few different training techniques into one set to shock a lagging muscle group like never before. Please use caution when trying these techniques, always use proper form and technique, always have a spot when you are planning on taking a set beyond failure, and never use a weight that is too heavy, you don't want to injure yourself for that extra set of growth.